This dish is all about simplicity, texture and flavor. It is one of my favorite recipes, because it is ridiculously simple and out-of-this-world delicious. 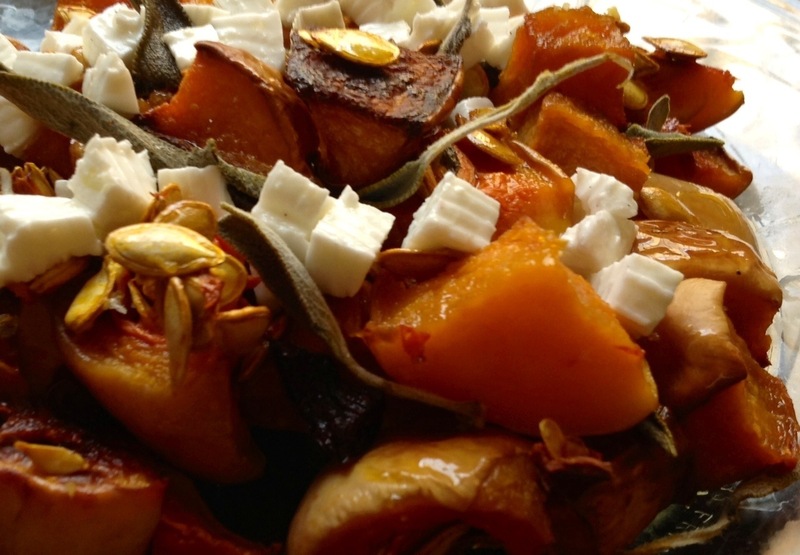 It is vegetarian, gluten free and can be used as a starter on a bed of leaves with Parmesan shavings, crumbled ricotta or feta, as a side to accompany any meal or even as a warm or cold salad served as a main course. And most people look at me in disbelief when I say that I simply wash the butternut squash and leave the skin on, no peeling. The skin is the best part, both nutritionally and in flavor. It softens up when its roasted and just introduces a different texture, with the buttery sweetness of the flesh and the caramelized, slightly charred edged skin. I even leave the seeds and the result is a nutty buttery treat with no added butter and no added nuts. 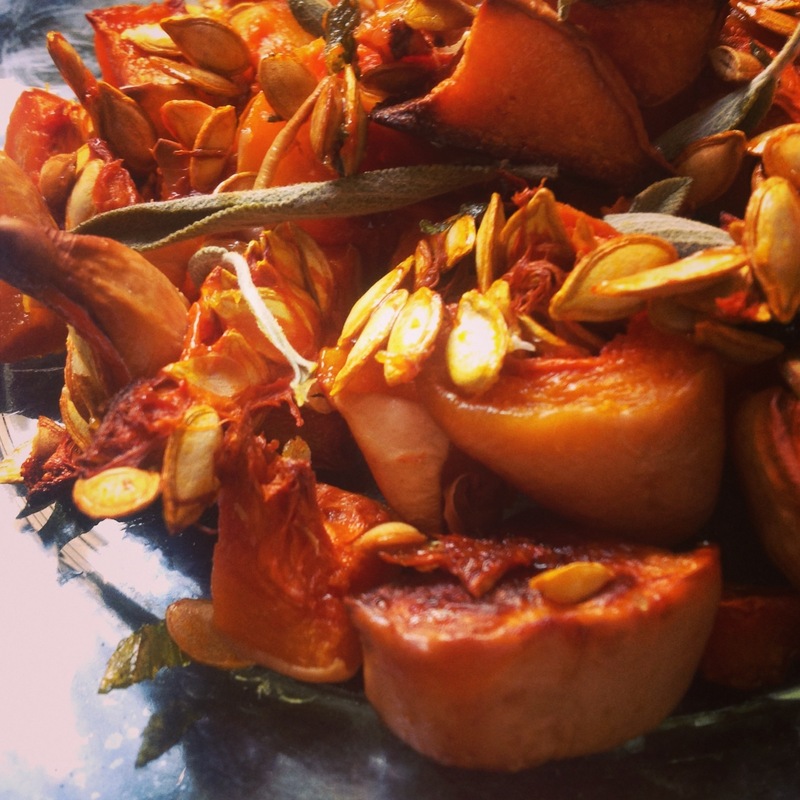 All the natural flavors as they are meant to be….After eating this you will understand why it’s called butternut ! I have a bunch of fresh herbs and I add sage leaves to the roasting pan. They crisp up and I find the combination of these flavors irresistible. Line an oven tray with tinfoil to avoid a lot of cleaning after. Remove the stalk from the butter nut squash if it has one and cut off the other end and discard. Wash the butternut squash and dry it. Chop up into cubes and leave the seeds and skin on. Drizzle not more than one spoon of olive oil on the bottom of the tray. Put the chopped butternut squash and sage leaves on the tray and mix then using your hands so that the oil slightly coats the butternut squash. I have fresh sage leaves at home but you can leave them out if you do not have them available. Flatten the squash cubes so that you only have one layer. Add a few more age leaves if desired. Place in the oven for 45 minutes or until the cubes are cooked through and some of the corners are starting to crisp. Serve as a salad with arugula or fresh leaves or simply alone as a side. The sage leaves are delicious even eaten alone ! Wow, absolutely delicious! It’s so buttery and rich and the tang of the feta is so nice. Thanks for this recipe since it’s so simple to make I was surprised to get such a great result! Thanks, Lea. So glad you enjoyed it is so incredibly quick to make …, thank you so much Liz for your feedback ! This recipe is so delicious. 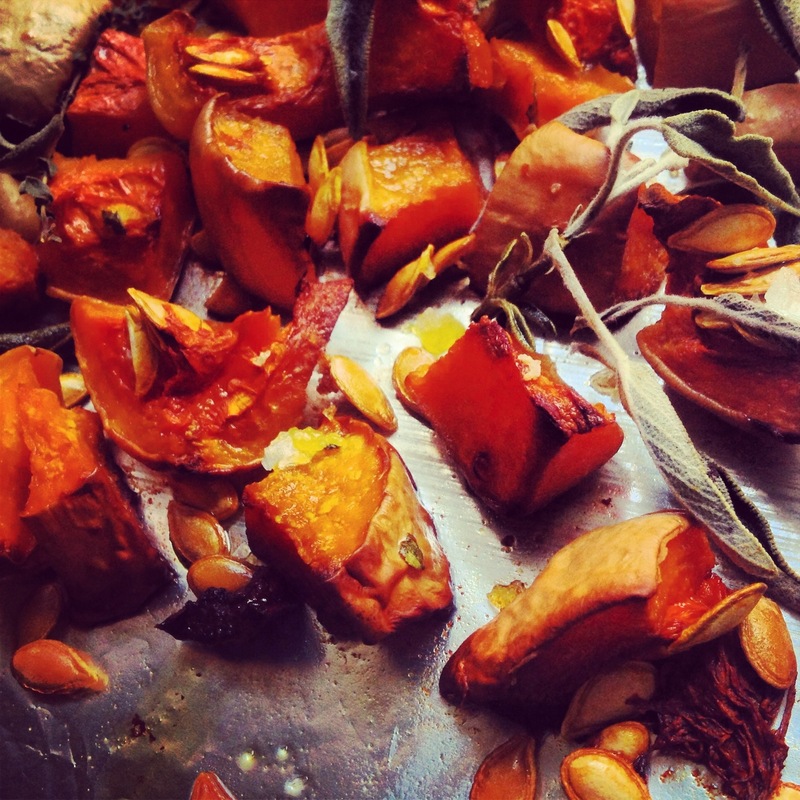 I loved the buttery melt in your mouth taste of the butternut squash and the crispy sage leaves! Will be making this again and again!!!!!!!!! Thank you Jackie, thrilled you like it ands I also think the crispy sage leaves are fantastic ! Much appreciate your feedback !